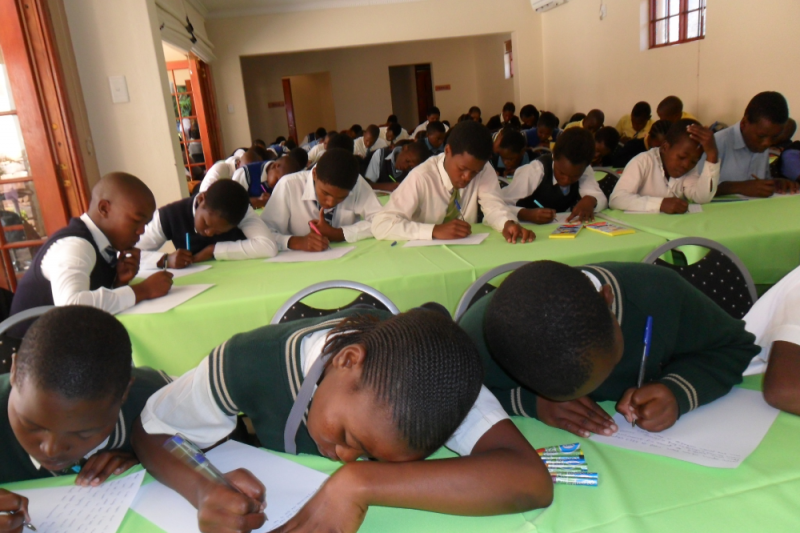 The Dancing Pencils Literacy Development Project is a South African Not-for-Profit Organisation that has worked for 23 years to help children, particularly in deep rural areas of South Africa, to write publishable stories. The children are taught via Dancing Pencils Writing Clubs, working under trained mentors. Dancing Pencils has helped publish more than 2000 book titles books by young and old in many languages, including English, Zulu and Xhosa. Club members come annually, often from remote rural areas, to a large venue in Durban to launch their new anthologies. This is a day of great pride for many attendees as they present their achievements. Our National Department of Education in Pretoria endorses the work of Dancing Pencils and delegates an official to open the launch. The successes of these young people benefit both them personally and the country as a whole. Children trained through Dancing Pencils have gone on to be TV producers, musicians, journalists, doctors and other professionals and many credited this training for making a positive influence on them. Thanks to our sponsors and donors, the 2017 Annual Launch in September last year was a great success, and we raised $780 for the event and for the development of our writing clubs. It is time for our next event, and we are seeking sponsorship and donations to offset expenses of our 2018 Annual Launch , which will be held on November 10th, 2018, in Durban. Excess funds received will be used for the development of our rural writing clubs. Our goal is to beat (or at least match) the total raised last year. Any financial assistance is much appreciated. Should you represent a business that would like to assist with sponsorship, please contact us using the information on our website. I am working with authority of Dancing Pencils to assist in this fundraising effort. The Dancing Pencils Literacy Development Project is a Not for Profit organisation, established in 2004, with fund raising number FR2002/02040905/08. Thanks to everyone who donated to our 2017 Annual Campaign. We had a successful launch in September 2017 thanks to your kind efforts. It is time for our next launch, and as such we are doing another sponsorship and donation drive to assist in offsetting expenses, and to continue to provide writing development programs in rural South Africa. Our 2018 Annual Launch will be held on November 10th, at the BAT Center in Durban. We appreciate any financial support you can provide. As we did last year, excess funds will be used to assist with the development of writing clubs in rural areas. We would like to beat (or at least meet) our last year's donation total. Thank you for your continued interest in and support of our writing development program!